It’s amazing what raw eggs and beer can do to a man. What is more amazing is what they can do to a normally slow four legged beast that weighs as much as a truck whilst displaying a contrary nature. 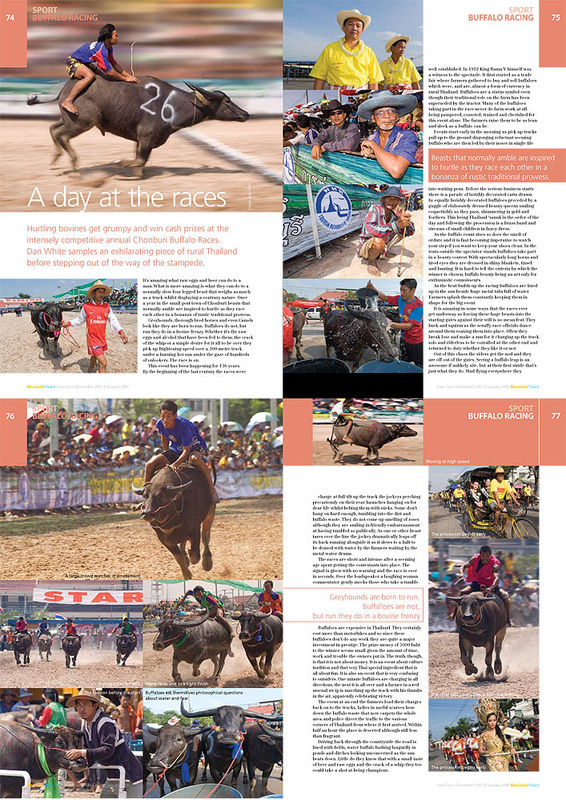 Once a year in the small port town of Chonburi beasts that normally amble are inspired to hurtle as they race each other in a bonanza of rustic traditional prowess. Greyhounds, thorough bred horses and even Camels look like they are born to run. Buffaloes do not, but run they do. Whether it’s the raw eggs and alcohol that have been fed to them, the crack of the whip or a simple desire for it all to be over they pick up frightening speed over a 300 metre track under a burning hot sun under the gaze of hundreds of onlookers. This event has been happening for 136 years. By the beginning of the last century the races were well established. In 1912 King Rama V himself was a witness to the spectacle. 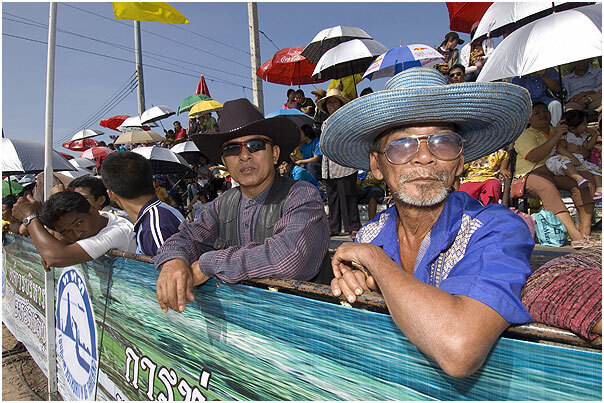 It first started as a trade fair where farmers gathered to buy and sell buffaloes which were, and are, almost a form of currency in rural Thailand. Buffaloes are a status symbol even though their traditional role on the farm has been superseded by the tractor. Many of the buffaloes taking part in the race never do farm work at all being trained and cherished for this event alone. The farmers raise them to be as lean and sleek as a buffalo can be. Events start early in the morning as pick up trucks pull up to the ground disgorging reluctant seeming buffalo who are then led by their noses in single file into waiting pens. Before the serious business starts there is a parade of lavishly decorated carts drawn by equally lavishly decorated buffaloes preceded by a gaggle of elaborately dressed beauty queens smiling coquettishly as they pass, shimmering in gold and feathers. This being Thailand ‘sanuk’is the order of the day and following the procession is a brass band and streams of small children in fancy dress. As the buffalo count rises so does the smell of ordure and it is fast becoming imperative to watch your step if you want to keep your shoes clean. In the tents outside the spectator stands buffaloes take part in a beauty contest. With spectacularly long horns and tired eyes they are dressed in shiny blankets, tinsel and bunting. It is hard to tell the criteria by which the winner is chosen, buffalo beauty being an art only for enthusiastic connoisseurs. 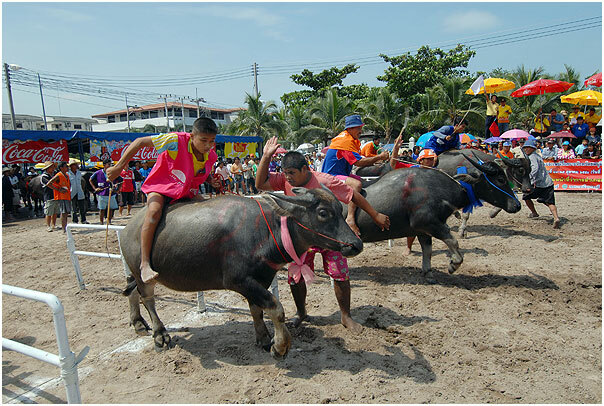 As the heat builds up the racing buffaloes are lined up in the sun beside huge metal tubs full of water. Farmers splash them constantly keeping them in shape for the big event. It is amazing in some ways that the races ever get underway as forcing these huge beasts into the starting gates against their will is no mean feat. They buck and squirm as the scruffy race officials dance around them coaxing them into place. Often they break lose and make a run for it charging up the track solo and riderless to be corralled at the other end and returned to duty whether they like it or not. Out of this chaos the riders get the nod and they are off out of the gates. Seeing a buffalo leap is an awesome if unlikely site, but at their first stride that’s just what they do. Mud flying everywhere they charge at full tilt up the track the jockeys perching precariously on their rear haunches hanging on for dear life whilst belting them with sticks. Some don’t hang on hard enough, tumbling into the dirt and buffalo waste. They do not come up smelling of roses although they are smiling in friendly embarrassment at having tumbled so publically. As one or other beast tares over the line the jockey dramatically leaps off its back running alongside it as it slows to a halt to be doused with water by the farmers waiting by the metal water drums. The races are short and intense after a seeming age spent getting the contestants into place. The signal is given with no warning and the race is over in seconds. Over the loudspeaker a laughing woman commentator gently mocks those who take a tumble. 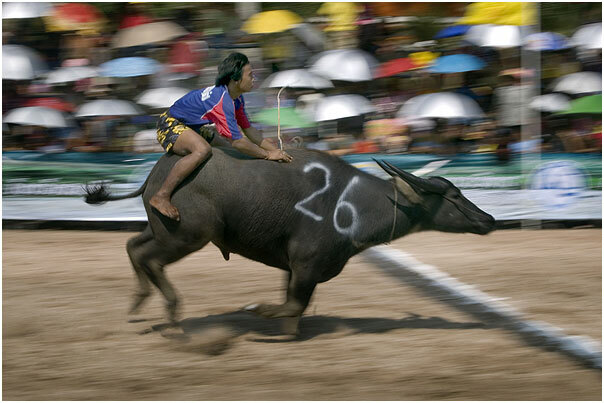 Buffaloes are expensive in Thailand. They certainly cost more than motorbikes and so since these buffaloes don’t do any work they are quite a major investment in prestige. The prize money of 5000 baht to the winner seems small given the amount of time, work and trouble the owners put in. The truth, though, is that it is not about money. 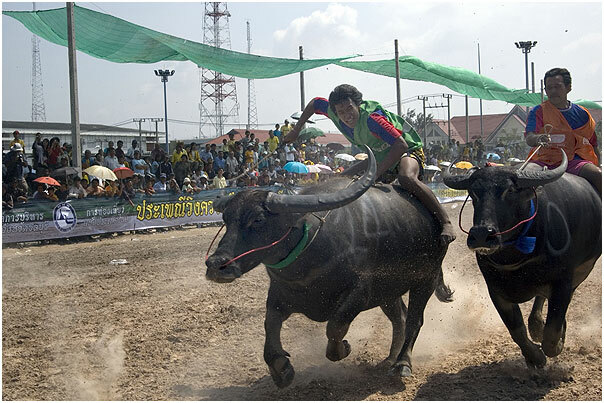 It is an event about culture tradition and that very Thai special ingredient that is all about fun. It is also an event that is very confusing to outsiders. 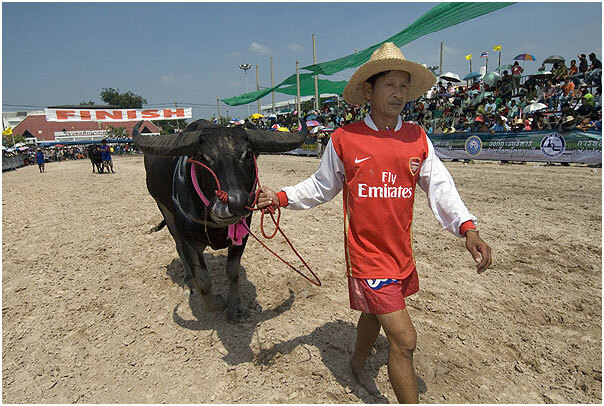 One minute buffaloes are charging in all directions, the next it is all over and a farmer in a red arsenal strip is marching up the track with his thumbs in the air, apparently celebrating victory. The event at an end the farmers load their charges back on to the trucks, ladies in useful scarves hose down the buffalo waste that now carpets the whole area and police direct the traffic to the various corners of Thailand from where it first arrived. Within half an hour the place is deserted although still less than fragrant. Driving back through the countryside the road is lined with fields, water buffalo bathing languidly in ponds and ditches looking unconcerned as the sun beats down. Little do they know that with a small taste of beer and raw eggs and the crack of a whip they too could take a shot at being champions.